Severe burn-induced liver damage and dysfunction is associated with endoplasmic reticulum (ER) stress. ER stress has been shown to regulate global protein synthesis. In the current study, we induced ER stress in vitro and estimated the effect of ER stress on hepatic protein synthesis. The aim was two-fold: (1) to establish an in vitro model to isotopically measure hepatic protein synthesis and (2) to evaluate protein fractional synthetic rate (FSR) in response to ER stress. Human hepatocellular carcinoma cells (HepG2) were cultured in medium supplemented with stable isotopes 1,2-13C2-glycine and L-[ring-13C6]phenylalanine. ER stress was induced by exposing the cells to 100 nM of thapsigargin (TG). Cell content was collected from day 0 to 14. Alterations in cytosolic calcium were measured by calcium imaging and ER stress markers were confirmed by Western blotting. The precursor and product enrichments were detected by GC-MS analysis for FSR calculation. We found that the hepatic protein FSR were 0.97±0.02 and 0.99±0.05%/hr calculated from 1,2-13C2-glycine and L-[ring-13C6]phenylalanine, respectively. TG depleted ER calcium stores and induced ER stress by upregulating p-IRE-1 and Bip. FSR dramatically decreased to 0.68±0.03 and 0.60±0.06%/hr in the TG treatment group (p<0.05, vs. control). TG-induced ER stress inhibited hepatic protein synthesis. The stable isotope tracer incorporation technique is a useful method for studying the effects of ER stress on hepatic protein synthesis. The liver plays a critical role in regulating metabolic and immune responses after severe burn [1, 2]. Severe burn causes liver damage and dysfunction, demonstrated by increased hepatic apoptosis and decreased liver derived albumin up to 2 weeks post-burn in a murine model . Recently, we found that elevated intracellular calcium and endoplasmic reticulum (ER) stress play critical roles in mediating post-burn hepatic damage . ER is the first compartment of protein secretary pathway in eukaryotic cells. After translation, unfolded polypeptide chains dissociate from ribosome and enter the ER for post-translational modification. Misfolded and unfolded protein accumulation in the ER disrupts its function and causes ER stress followed by numerous subsequent metabolic responses [5, 6]. Interestingly, ER stress has been shown to inhibit protein synthesis by regulating its translational processes [7-9]. We, therefore, hypothesize that ER stress plays a key role in mediating protein synthesis in the liver post-burn. In the current study, we treated HepG2 cells with thapsigargin (TG), a SERCA pump inhibitor and evaluated the effects of ER stress on protein synthesis. The aims of the present study are: 1) to establish an in vitro model to isotopically measure hepatic protein synthesis and 2) to evaluate protein fractional synthetic rate (FSR) in response to ER stress by using this model. We propose a new technique for quantifying liver protein synthesis in the current study. Determination of protein synthesis using the tracer incorporation technique involves measuring the rate of incorporation of a tracer amino acid into the product protein over time . Stable isotopes are superior to radioactive isotopes because they are free from the potential risk of radioactive contamination and cell damage . Thus, we chose stable isotope tracers for the present study. In this study, we used 1,2-13C2-glycine and L-[ring-13C6]phenylalanine as tracers simultaneously; both are stable isotopes commonly used for protein synthesis in basic and clinical research [12, 13]. This would enable us to compare protein synthesis rates calculated from different tracers. Also, we measured intracellular free amino acid enrichments as an alternative precursor for calculating protein FSR, and compared it with the plateau enrichment of protein-bound amino acids. The above methodological considerations served to establish HepG2 in vitro model for protein synthesis measurement. Cell culture. Human hepatocellular carcinoma cells (HepG2) were cultured in Dulbecco's Modified Eagle Medium (DMEM) containing 10% fetal bovine serum, 1% penicillin/streptomycin, 2 mM L-Glutamine and were incubated at 37°C in a humidified atmosphere of ambient air with 5% CO2. 0.25% trypsin-EDTA was applied for passage when cell confluent was over 90%. All of medium with supplements were provided by Gibco® Invitrogen Corporation, CA. Two stable isotope labeled amino acids, including 1,2-13C2-glycine (1.02) and L-[ring-13C6]phenylalanine (0.31) from Cambridge IsotopeLaboratories, MA (numbers in parentheses are mass ratios of labeled to unlabeled substrates), were supplemented and mixed well in DMEM culture medium. This isotope-labeled culture medium was stored at 4°C and used throughout the entire experiment. Cells were grown with the isotope-labeled culture medium from day 0. When cells reached confluence at day 4, a portion of cells was subcultured for an additional 3 passages (to day 14) using the same isotope tracer-enriched culture medium. From day 0 to day 14, cells were harvested at each designated time point and stored at -80oC for further processing and analysis. In prior to examination for hepatic protein synthesis in response to ER stress, HepG2 cells were treated the typical ER stress inducer TG from 1 nM to 1 µM over a 24-hour period to determine the dose and time response. The treated cells were transferred to the isotope-labeled culture medium and harvested followed by the procedure described as above. The experiment was conducted four times independently. Antibodies and reagents. Antibodies against human glucose-regulated protein (GRP78/Bip) and phosphor-inositol requiring enzyme 1 (p-IRE-1) were purchased from Abcam Inc. (Cambridge, MA); Glyceraldehyde 3-phosphate dehydrogenase (GAPDH) were purchased from Cell Signaling Tech, Inc. (Danvers, MA); Dimethyl sulfoxide (DMSO) was from Sigma-Aldrich, Inc. (San Louis, MO); SuperSignal West Pico Chemiluminescent Substrate was purchased from Thermo Scientific Inc. (Rockford, IL). Calcium imaging. Cells were labeled with Fura 2-acetoxymethyl ester at 25°C in 107 mM NaCl, 7.2 mM KCl, 1.2 mM MgCl2, 1 mM CaCl2, 11.5 mM glucose, 0.1% bovine serum albumin, and 20 mM Hepes (pH 7.2), and calcium imaging was done as described  by using MetaFluor data acquisition and analysis software (Molecular Devices, Inc. Sunnyvale, CA). Fluorescent images were displayed with pseudocolors using the IMD display mode. Western blotting. HepG2 cells were collected and homogenized in 150 mM NaCl, 50 mM Tris-HCl, pH 7.8, 1% (w/v) Triton X-100, 1 mM EDTA, 0.5 mM phenylmethanesulfonyl fluoride, 1X complete protease inhibitor mixture (Roche Molecular Biochemicals, Indianapolis, IN) and a phosphatase inhibitor cocktail (Sigma-Aldrich, San Louis, MO). The homogenate was centrifuged at 20,000 xg for 30 minutes at 4°C and the pellet discarded. Twenty micrograms of each protein sample was subsequently analyzed by SDS-PAGE and Western blotting. Analytical methods. Intracellular free amino acids and protein were isolated as previously described . Briefly, cells were homogenized in 5% perchloric acid at 4°C. The pooled supernatant was used to measure intracellular free amino acid enrichment. The pellet was then washed and dried at 50°C overnight. The dried pellets were hydrolyzed in 6N constant boiling HCl. Amino acids from the cell supernatant and pellet hydrolysate were isolated using a cation exchange column (Dowex AG 50W-X8, Bio-Rad Laboratories, Hercules, CA) and dried in a rotary vacuum evaporator. The intracellular free amino acids and protein hydrolysates were derivatized with N-methyl-N-(t-butyldimethylsilyl) trifluoroacetamide at 100°C for 1 hour for 1,2-13C2-glycine and L-[ring-13C6]phenylalanine enrichment measurements. The enrichments of intracellular amino acids and protein-bound amino acids were measured by Gas chromatography-mass spectrometry (GC-MS). The abundance of ions was monitored at the mass to charge ratio (m/z) 246 and 248 (m+0, m+2) for glycine, and at m/z 234 and 240(m+0, m+6) for phenylalanine. Enrichments were expressed as “tracer to tracee ratios” (TTR). Where Et2 - Et1 is the change in product enrichment (protein) between time points t2 and t1, and Ep is the mean precursor enrichment over the time (t2 - t1). As described in greater detail in the Results section, it was necessary to define the appropriate time course for linear change of product enrichment, and delineate product plateau enrichment as well. The linear change of product enrichment was validated to calculate the FSR. The true precursor enrichment for calculation of the FSR of protein is represented by the product plateau enrichment. Differences between two variables were evaluated by pair t-test. Linear regression was evaluated by Pearson product-moment correlation coefficient (R2). Significance was accepted at p<0.05. Data are expressed as means ± SEM. 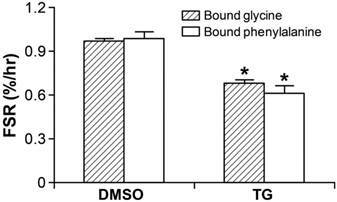 In HepG2 cells, protein-bound enrichments arose and reached plateaus after 7 days of cell culture (glycine TTR=18.53±0.61% and phenylalanine TTR=26.02±1.15%) (Figure 1A). Linear regression analysis showed that the R2 values were 0.99 for both 1,2-13C2-glycine and L-[ring-13C6]phenylalanine enrichments in the protein-bound amino acid pool from 0 to 72 hours (Figure 1B). Thus, the increase in product enrichment was calculated from 0 to 72 hours. Because of the linear increase in product enrichment during this period, we speculate that the tracer recycling from protein breakdown is negligible, and the equation for FSR calculation is valid in the current study. (A) Changes of protein-bound amino acid enrichments till day 14 in HepG2 cultured in DMEM supplemented with stable isotope tracers of 1,2-13C2-glycine and L-[ring-13C6]phenylalanine. Enrichments are expressed as tracer to tracee ratio (TTR). (B) Linear regression analysis for the change of protein-bound amino acid enrichments in HepG2 with glycine and phenylalanine isotopes from 0 to 72 hours. Using the product plateau enrichment as the true precursor enrichment, we found that FSR were 0.97±0.02 and 0.99±0.05%/hr calculated from 1,2-13C2-glycine and L-[ring-13C6]phenylalanine, respectively. There was no significant difference when using these two tracers (p=0.52). Intracellular free amino acid enrichments reached constant values immediately, which were stable throughout the period of experiment (average intracellular free glycine TTR= 20.22±0.51% and free phenylalanine TTR=26.21±1.51%). No significant difference was found between the average of the intracellular TTR and plateau TTR measured with either glycine or phenylalanine. 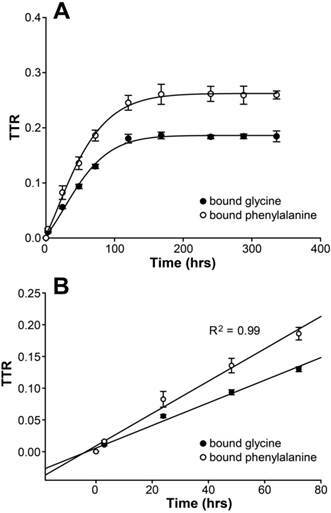 When the corresponding intracellular free amino acid enrichments were used, FSR was 0.93±0.04%/hr with glycine labeling and 0.99±0.01%/hr with phenylalanine, which were not significantly different (p = 0.08) (Table 1). ER is the major intracellular place of abundant calcium storage. We examined cytosolic calcium alterations in HepG2 cells by using an ionophore, inonomycin. We found that the response to ionomycin diminished as the TG dose increased; further, there was no response to increasing doses of TG to 100 nM and 1 µM, indicating calcium was completely depleted from ER storage with a higher dose of 24-hour TG treatment Figure 2A and B). TG induced alterations in hepatic calcium homeostasis. (A) Representative fura-2 ratio images of cytosolic calcium in HepG2 cells from different dose of TG treatment for 24 hours. Ratio values are pseudocolored as per the scale bar. 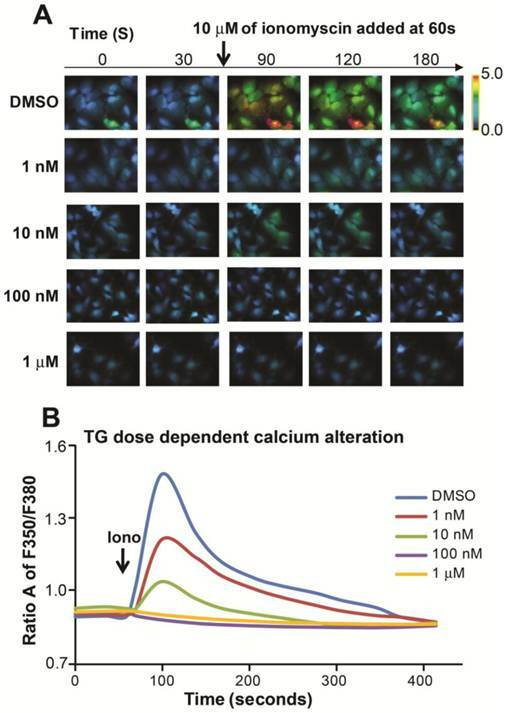 (B) Single-cell imaging of depletion of ER calcium stores with different dose of TG treatment. Each trace is an average of 20 cells from a single experiment. Fluorescence Ratio A at 350 nm to 380 nm stands for intracellular calcium level. Protein FSR calculated with different precursors in HepG2 cells. Data were collected in hepatocytes cultured in DMEM supplemented with stable isotope tracers of 1,2-13C2-glycine and L-[ring-13C6]phenylalanine. Enrichments are expressed as TTR. Et2 - Et1 is the change in product enrichment (protein) between time-points t2 and t1, and Ep is the mean precursor enrichment over the time (t2 to t1) or the mean of product plateau. Data are expressed as means ± SEM. We found that a dose of 100 nM TG led to the expression of two prominent ER stress markers, glucose-regulated protein (GRP78/Bip) and phosphor-inositol requiring enzyme 1 (p-IRE-1) (Figure 3A). Furthermore, we treated cells with 100 nM of TG over the time period and observed that the expression of GRP78/Bip and p-IRE-1 were upregulated at 6 hours and the expression of p-IRE-1 increased significantly at the 24-hour time point when compared to the DMSO treatment (Figure 3B). TG induced ER stress in a dose- and time-dependent manner in HepG2 cells. (A) Cells were treated with TG from 1 nM to 1 µM for 24 hours; (B) Cells were treated with 100 nM of TG from 1 hour to 24 hours. 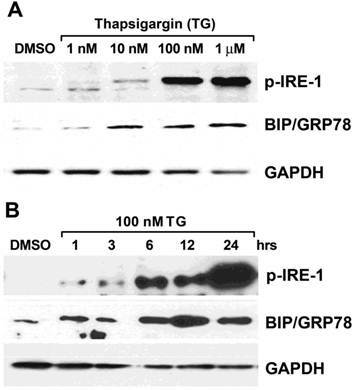 Two of ER stress markers p-IRE-1 and GRP78/Bip were detected by Western blot analysis. The expression of GAPDH was served as a loading control. Based the above cellular response, we thus chose the condition of 24 hours, 100 nM of TG treatment to conduct the next experiment of protein synthesis measurement. Following 100 nM of TG 24-hour treatment, the cells were transferred to the isotope-labeled culture medium and harvested followed by the procedure described in the Materials and Methods section as above. R2 values were 0.96 and 0.98 for glycine and phenylalanine enrichments, respectively in the protein-bound pool from 0 to 72 hours. FSR significantly (p<0.05) decreased to 0.68±0.03 and 0.61±0.06%/hr, calculated using the plateau enrichments of glycine and phenylalanine as precursor enrichments, respectively (p<0.05), demonstrating inhibition of protein synthesis in response to TG-induced ER stress (Figure 4). Hepatic FSR (%/hr) significantly decreased in HepG2 cell with 24-hour TG treatment by detecting with both stable isotope tracers of 1,2-13C2-glycine and L-[ring-13C6]phenylalanine. * p<0.05, TG-treated group vs. DMSO-treated vehicle group. Data are expressed as means ± SEM. In the current study, we found that protein-bound amino acid enrichments linearly increased from 0 to 72 hours of cell culture, and reached a plateau after 7 days of cell culture. By using two different stable isotope labeled amino acids simultaneously, we established an in vitro model to measure protein synthesis in HepG2 cells. We chose one non-essential amino acid glycine and one essential amino acid phenylalanine as tracers to conduct the current study because they are easily available and been widely applied in the many areas of research. Linear change of enrichment for both tracers within 72 hours indicates that intracellular amino acid recycle is negligible and FSR equation is valid. The values of FSR were comparable between the glycine and phenylalanine tracers, indicating the consistency and reproducibility of the current model. Aminoacyl-tRNA pool enrichment has been thought to be the true precursor of protein synthesis . However, the measurement of aminoacyl-tRNA is complicated. True precursor enrichment can be determined by continuing the tracer infusion until a plateau is reached in the product enrichment theoretically . Martini et al  found that the protein-bound enrichment increased linearly for the first 3 days and essentially reached the plateau enrichment by day 5 in fibroblast and myocyte. They concluded that intracellular free amino acid enrichment is an optimal surrogate for precursor enrichment. In our study, the TTRs of glycine and phenylalanine are 1.03 and 0.31 in the medium, which are higher than the intracellular levels. However, the intracellular enrichment of both amino acids are consistent with the plateau in product enrichment, and there was no significant difference of FSR value when calculated by product plateau or intracellular free amino acid enrichment in hepatocytes. Thus, if necessary the intracellular free amino acid enrichments are accepted as precursor enrichments for FSR calculation. Intracellular protein breakdown may affect the accuracy of FSR calculation through amino acid recycling intracellularly, meaning that the amino acids released from proteolysis are re-synthesized into protein. This amino acids recycling may underestimate protein FSR because the recycling tracer is not included in FSR calculation. Thus, a correction has to be made to the equation if the recycling accounts for a significant amount. In this experiment, we assume that the protein breakdown is negligible within 72 hours of cell culture. This is because HepG2 cells grow from 50% to 90%, from day 0 to day 4 in culture dishes. In addition, a linear increase of protein-bound amino acid enrichment from 0 to 72 hours was observed. TG was known as a typical ER stress inducer. It blocks sarco/ER Ca2+ ATPase (SERCA) activity to deplete calcium from ER storage and subsequently induces ER stress [18, 19]. TG was found to serve as a rapid, potent, and efficacious inhibitor of amino acid incorporation in cultured mammalian cells [20-22]. In the present study, we demonstrated that TG induced calcium depletion from ER and ER stress activation in both a dose- and time-dependent manner. In addition, we found that TG induced ER stress in other hepatocyte cell lines such as human primary hepatocyte and HUH7, and also observed the similar results compared to the current study (unpublished data). Further, protein FSR decreased as expected with 100 nM of TG treatment for 24 hours in HepG2 cells. With both glycine and phenylalanine isotope tracers, we found that the protein-bound amino acid enrichments also increased linearly, and FSR values, which were calculated using the intracellular free amino acid enrichments as precursor enrichment, were also close to those calculated using the plateau product enrichment as the precursor enrichment, indicating the reproducibility of the current methodology, even in response to external stress. In addition, we found that TG induced ER stress in other hepatocyte cell lines such as human primary hepatocyte and HUH7, and also observed the similar results compared to the current study (unpublished data). We did not explore that molecular signal pathway of ER stress modulating protein synthesis in this study. ER stress was shown to regulate protein synthesis at the initiation and elongation steps [23-25]. ER stress inhibits protein synthesis via activated PERK dependent eIF2 (eukaryotic translation initiation factor 2) phosphorylation . Hypoxic injury attenuated protein synthesis via elongation factor 2 (eEF2) in cardiomyocytes, which is associated with AMP-activated protein kinase (AMPK) activation . In the current study, we confirmed that TG-induced ER stress inhibits hepatic protein synthesis with decreased protein fractional synthetic rate. The molecular mechanism of the underlying event will be further investigated. In conclusion, we used stable isotope tracer incorporation technique to measure protein synthesis in the current HepG2 cell model. Protein synthesis rates calculated from intracellular free amino acid enrichments were close to the true values calculated from product plateau in hepatocytes. Furthermore, by using the current established model, we found that hepatic protein FSR decreased in response to TG-induced ER stress. The measurement of liver protein synthesis can be used to assess liver impairment and function recovery as well as to test the effects of different stimuli and pathophysiological conditions on protein metabolism. This model may provide a powerful tool to further investigate the mechanism of cellular signaling regulation in hepatic protein synthesis. This work was supported by grants from Shriners Hospitals for Children (#8490, #8640, and #8690), National Institutes of Health (R01-GM087285-01A2, T32-GM08256), and Department of Surgery at UT Health Science Center at San Antonio (131655). We thank Eileen Figueroa and Steve Schuenke for their assistance in preparing this manuscript.